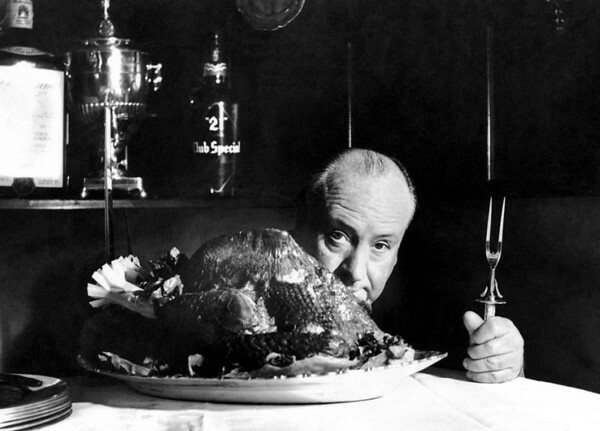 Have a relaxing holiday….Hitch wants you to. Tomorrow marks the 20th time my wife and I have celebrated Thanksgiving since we met, and the 19th in which we’ve celebrated by staying at home. After we moved in together for college, we determined to stay home for Thanksgiving, as (a) we were planning on going home for Christmas and (b) the time spent traveling and visiting could be better spent that close to finals. It’s become our favorite holiday BECAUSE we stay home. We’ve traveled for all the others, but not this one! Along the way we’ll imbibe our favorite wine, reflect on the things that were good from the previous year, try to avoid thinking of whatever has gone wrong, and think of friends and family. At some point, perhaps tonight, we will watch the infamous WKRP Thanksgiving episode. Friday perhaps we’ll dare some shopping, but usually we skip that nightmare. Perhaps we’ll just take our daughter to a park instead. But the main thing is WE will be home together, with our daughter and our cats, and that is always the best of things. All the [depressing] news that’s fit to print…. From the New York Times, a depressing story about what it is like to be long-term unemployed. This largely matches the experience that I’ve had, and the experience of those I know in this boat. Sam Behr died recently. He was 86. Here in Orlando he was notable for two things. First, he had a store downtown that sold shoes. The store’s slogan was “We can fit any human!” And they had any number of improbable stories backing it up. Second, in the 1980s he became a local media celebrity for his work on TV commercials for Allied Discount Tires, a local tire chain, run by a friend of his if I recall correctly. Rest in Peace, Sam, and here’s hoping that in the afterlife your nuts always get hand-torqued and never fall off! UPDATE: I added a link to the local obit above. And according to local legend (which has a grain of truth to it), the ad I embedded above only ran once. I actually saw that one on TV one summer, I’m happy to say! Sam represented a type of garrulous Southern man that has become increasingly rare, sadly. UPDATE 2: Here’s another piece about Sam and the commercials he did – all unscripted! And here’s probably the most infamous ad he did. Remember Oral Roberts? Bullying has been much in the news lately. In particular, the case of Jonathan Martin of the Miami Dolphins has created a lot of furor. Either way, it’s still drowning. More wisdom from the archives! The Ambivablog archives, that is. Your own personal Flynn Effect! Actually, doesn’t sound mysterious to me — sounds like you were learning how to ace IQ tests! Has a 15-year-old explained the Flynn Effect? UPDATE: Basically, the 15 year-old has posited that, in fact, people have been learning how to ace IQ tests. Or at least do them better. It’s interesting stuff, honest! … while looking for something buried in archives, I may as well post a link to something else interesting. Well, I find in interesting. Also, good to see how I’ve been wrong and right about certain things. Turns out there WAS one more meaningful national election (2010) and that Rahm wasn’t able to screw up the census as badly as I suspected. I largely stand by most of the doom and gloom related to, but not directly a part of, the link above. Written by me almost five years ago. So far I’ve been correct.